Yes, I would like to order one Blue Screen of Death, please. Wow, that was quick! Thanks. Blue Screen of Death: There is no escaping it. "that right there is a linux BSOD" how do you figure? It says something about error on drive C or drive E doesn't it? On linux they don't do it like that, they have /dev/hda1 or /dev/sda4 that type of thing. When I've seen linux crash it never looked like this, it was either kernel oops type message, or it just plain froze. 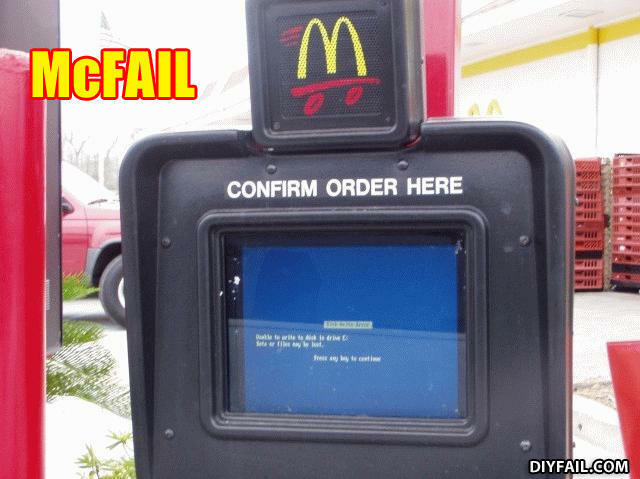 hahahaha McDonald's got the BSOD(Blue Screen Of Death)!!!!! Do you want any condiments with that BSOD, because I won't give them to you anyway. - Are you thinking what I'm thinking B1?